In a move of solidarity for continued access to a free internet, major tech companies are reaching out to their readers and customers in various ways to rally to the cause of Net Neutrality. Google, Facebook, Twitter, Reddit and Amazon are among the firms joining the resistance. In case you have been living in the wild without internet the last few months, the Federal Communications Commission is seeking to rollback protections for the internet installed in 2015 by the Obama administration to keep cable and phone providers from limiting what sites you can visit. If the laws weren't in place, companies could block or slow down access to certain domains unless those sites paid them to allow users in, or even charge users additional package fees in the way cable companies charge for access to premium cable channels. The FCC will be open to comments on Monday regarding its just-published proposal. Sites such as Twitter, Netflix and Spotify have banners across the tops of their sites encouraging users defend net neutrality, and then linking to pages with more information. Google has made a blog post saying “the net neutrality rules that protect the open internet are in danger of being dismantled,” while Twitter's blog post is pushing the use of the #NetNeutrality hashtag to show solidarity. Advocacy group Battle for the Net said sites across the internet are being creative in using “blocked,” “upgrade,” and “spinning wheel of death” pop-ups to show users how surfing the web would look if net neutrality was eliminated. The American Civil Liberties Union has also joined in the protest. If you value a free internet, find out who your Senator and Representatives are and flood their offices with calls supporting Net Neutrality. 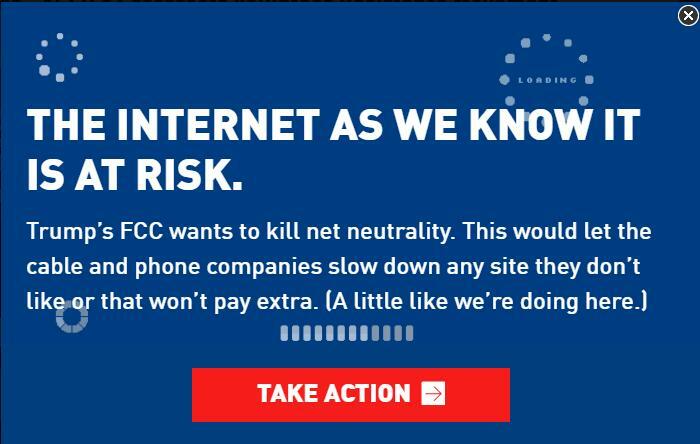 Then be sure to hit up the FCC on July 17 to offer your comments that you don't want companies such as AT&T, Comcast, Verizon and others dictating how you use the world wide web. It's nice to see the big tech companies behind this. Tangent: Whenever the next major update to Shacknews code happens it would be rather fantastic to still be able to view the article while viewing/replying in the comments. Windows latest chatty has this! I'm just a luddite who uses a web browser to browse websites.